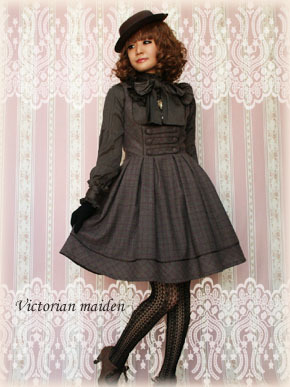 Victorian Maiden has a new series of dress released today - the British Check series. There's a one piece, a jumperskirt, and a skirt. I really like all the pieces! They all come in red, grey, or yellow tartan. 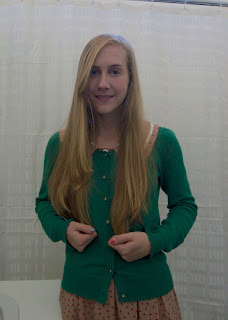 I bought the jumperskirt in grey! The OP is very demure with a nice long skirt. I'm not that fond of this colourway because it looks so much like Christmas. I adored this dress as soon as I saw it months ago. It seems like I'm fond of underbust jumperskirts! This will be my second. 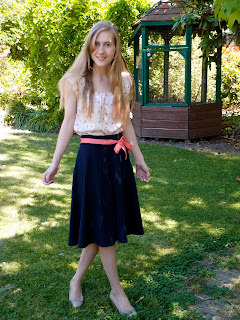 I really like the skirt, but it seems to me like the hemlines are creeping upwards ever so slowly! It's still beautiful. I bought the grey jumperskirt through Gosurori Order today. They've been aware of my intentions to buy the dress for weeks now, because it was sold out in reserve when I first contacted them. We've been working together checking the site for updates and finally the dress was released! And we POUNCED. I've ordered through Gosurori Order before - that's how I got my VM Adele Bustier dress. It's a good fast service, and apparently they're good at avoiding customs fees (in Australia that's not a problem). I'm sure I'll think of lots of other interesting ways to wear this dress. It's being sent to my house in Australia, so it'll be there when I get home in 2 weeks exactly! That's another thing to welcome me home. I really don't want to go home! My new life here is wonderful!